Came in on a cruise for the day. A bit of a challenge getting picked up at the port. Van showed up quite late, and would only take drivers back to the office since there were so many people waiting. They should have sent more than one van. Obviously, this meant that I had to go back to the port to pick up my wife after picking up the car. Once I got to the office, the experience was quite positive. Without a doubt, the most personable and professional car rental agency staff Ive ever encountered. Vehicle was clean and operated perfectly. Rental return process and getting back to the port all went smoothly. Overall very nice experience. 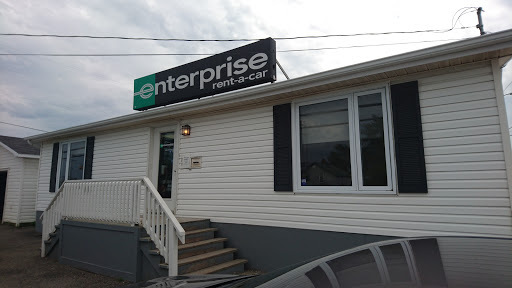 Easy pickup - We found our Sydney and Baddeck drive to be easy, directions from the Enterprise people was a Google map, but it worked fine. Our return was a little iffy, as we found construction had blocked the name of the street that we needed to turn onto to go back to the Enterprise office. So... we found the landfill and took a tour around it to get back to their office! Thank you for your pickup and delivery to our cruise ship! The service at this location was great. We were only going to be in town for a short time. They picked us up as soon as we arrived and we were in our car and on the road in 15 minutes! They even had printed out maps and recommendations on our route. They made our visit convenient and enjoyable. Excellent service. Friendly staff. We returned a car with a minor problem and were given a replacement/upgrade at no additional cost. Well definitely continue to deal with Enterprise. Pick up from and return to the cruise terminal was prompt and easy - staff was friendly and helpful. Would not hesitate to recommend this particular location. Fast friendly service. Very clean car. Pick up and drop off service. No waiting. Highly recommend. Great service: short wait, friendly and patient staff, in and out. Great service, punctual and courteous!